Just a quick public service announcement. A fellow whose twitter name is wiesel started a twibbon group called Pie Charts Must Die. If you join (click on the last link), your twitter avatar will display your support for this worthy cause. Posted: Tuesday, September 15th, 2009 under Amusement. Pie charts are definitely over used, and most often poorly so. however, there are times when the purpose of a chart is to hinder, rather than support interpretability of data. In that case, pie charts do the job well. Sure, and I’ve even admitted this from time to time. But the cases in which pie charts are effective are very few, limited to two or three unequally sized wedges, and if there are three, one should be much larger or smaller than the other two. Sure this crusade is close minded, and it’s a bit tongue-in-cheek. It’s a reaction to the 99+% of pie charts which are misapplied. The NOAA chart you cite is not necessarily bad because its Y axis is so tight. The axis limits do in fact enclose all of the data, and it’s a line chart, not a bar chart, so starting at a non-zero value is not a crime. The misleading part of the chart is that it shows the data since 2005, while the Open Mind chart shows the data from 1975, which actually tells a stronger story. Crusades against the humble pie chart are, in my opinion, justified if aimed at alerting users to the existance of more appropriate chart types. After all, it cannot be a bad thing to educate people in many different ways to display data. Charts are tools used to tell a story. Learning what the available tools are, how they work, and when to use them can only make us better storytellers. It follows then, that saying that ‘pie charts must die’ is going too far. Pie charts, like any other chart type, have their uses. As skilled chart users, we should not adopt a delete-and-forget attitude to pie charts. Rather, we should learn how to use them well; what they show, what they hide, how to position text elements for best results, how to colour, crosshatch, explode, and rotate. Charts, like politicians’ speeches, can be used for many things. They can inform, dissemble, confuse, and mislead (and often, any combination of these). 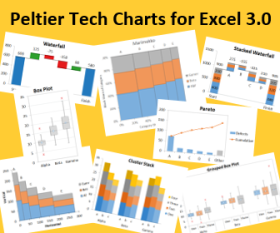 The skill in creating the correct chart lies in knowing how to achieve these effects with the right combination of charting techniques. And let us not lose sight of the fact that pie charts are not the only chart type that can be used to mislead. The most famous recent example I can think of how a chart can be used to mislead is found here http://www.esrl.noaa.gov/gmd/ccgg/trends/. It happens to be a line chart that uses one of the oldest tricks in the book (look at the y-axis) to misrepresent the data. I think you need to keep that other Excedl guru – J Walkenbach – aware of this campaign!!! Even the good guys come a cropper sometimes. Whoa, thanks for the heads up. I’ve written a little review of John’s chart selection in What’s Worse Than A Pie Chart?